I recently wrote an extended review of the PocketBook 360 ebook reader after having owned one for over a year. It wasn’t until after I posted it that I saw how long it was, so I’ve decided to summarize my love for the PB360. It’s a sad fact that having a user replaceable battery impresses me these days. It used to be a given that you could change a device’s batteries. Now at best you have to send stuff back, at worse you have a pretty brick. Not everyone belongs to the “replace your toys every 18 months” crowd. Ereaders have nice big glass screens that needs protecting. The PB360 has a hard cover that snaps on the back when in use, which means no ugly, bulky, heavy, “look it’s a book” covers. I don’t need a plate that only works at one restaurant. With my PB360 I can read a ton of formats, which means I can choose from a variety of retailers. There’s no special software either, I can plug my PB360 into any PC to copy books over. If Amazon’s prices get too absurd, what’re you gonna read on your Kindle? PDFs? I don’t want a keyboard that I need 0% of the time and takes up a third of the ereader. I don’t need it to play mp3s, or connect to a B&W slow internet. I want giant buttons that make it easy to turn pages, and I want something so light that when I drop it on my face I don’t get a concussion. Give me something elegant and functional that I actually can carry around everywhere. The PB360 delivers on all counts. I can customize just about everything on the PB360. You can add whatever fonts you want. You can specify any size, and change it on the fly. You can set your margins, the aliasing, what stuff to put in the status bar, or if you don’t want a status bar at all. You can reassign every button. You can set whatever screen savers images you want. You can organize your books as you see fit. Want to navigate by covers, fine. Lists? Fine too. Only want to refresh every 10 pages, making page turn wicked fast? You decide. What it all comes down to is this: if you like others calling the shots, buy a Nook or Kindle. If you like to have everything just the way you want it, buy a PocketBook 360. You won’t regret it. 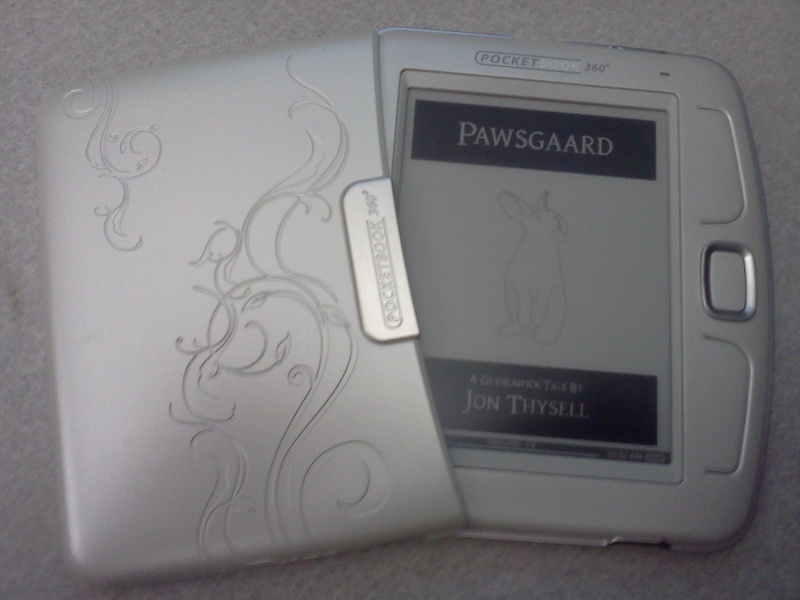 A year ago I purchased a PocketBook 360 e-reader, and after a month I wrote a review about the device on Amazon. It’s been my constant companion since then, and though I’ve tried most of the competiting devices, I still keep coming back to my good ol’ PB360. Over the years I’ve gotten kind of tired of black electronics, and the ivory PB360 looks great. I love the faux vine-engraving on the cover, and more than that, I love that it comes with a cover. Every other e-reader aficionado I’ve met has to buy a separate case, doubling or tripling their device’s weight, plus adding some useless flap you have to hold or fold back. The PB360’s included hard cover snaps effortlessly to the back when you’re reading, which is quite handy. The screen is a comfortable 5in e-ink, and I regularly read in the sunlight, so no glare issues or eye strain. I can’t overstate how wonderful that is. Don’t let the smaller size dissuade you, you’ll never miss the extra inch from the the 6in. Kindle or Nook screen. Of course, if you’re reading large-format technical works (say a textbook), then e-ink probably isn’t your best choice anyways. When it comes to page turns, forget other e-readers annoying flash to clear the screen after every page. The PB360 lets you specify how often you want to refresh (more on that in the software review below), which means the page-turn speed on this thing smokes other readers. Sure, eventually you need a full refresh, but I get by on every ten pages without the text getting ugly. I’ve read that the Kindle and Nook have finally added this feature, but they’re still slower and still refresh more often. Finally, one of the biggest draws of the PB360 was its lack of keyboard. Call me crazy, but I want to read on my e-reader. A full physical keyboard looks dumb, and is completely unnecessary 99.9% of the time. Never in this past year have I regretted not having a keyboard. There’s an on-screen keyboard if you really need it, but it’s been more a curiosity to me than anything else. The PB360 is tiny, but even with my giant hands I’ve not had any problems. The buttons are large and exactly where they need to be, right under my thumb. I can use the device completely one-handed, without getting tired or having to leverage the device against anything. I do most of my reading on the bus to and from work, or at night in bed. I can hold the device in one hand while the other holds the rail or defends my bags, or lay in bed and hold the device over my face without worrying about jeopardizing my beaut of a mug. I can slip it in my jacket pocket when I pay the fare, or while I’m paying for groceries. The thing weighs a measly 5.3 ounces, even with the cover! Even after year to catch up neither the latest Kindle (8.5oz) or Nook (7.43oz) beats that, and that’s sans cover. Finally, I turned off the accelerometer almost immediately after purchase, because I don’t want the screen to turn when I’m laying down in bed. But since it’s just a menu click away to manually the change orientation, I can easily flip the reader for left-hand use, say while I’m eating lunch. Flip your Kindle upside down and try to stay looking hip. I’m not exaggerating when I say I can literally count the number of times I’ve plugged in my PB360 to charge in this past year. I’ve gotten by with the trickle-charge from copying over books via USB. This thing is a monster and I go months at a time without needing to plug it in to anything. I’ve never worried about its battery dying. It’s also user replaceable, which is a big plus in my book. I’ll definitely get new batteries until my PB360 croaks. The PB360 has less internal memory than it’s competition. Doesn’t bother me. I’m carrying about 150 books on the internal memory, which takes up a grand total of 66MB. I still have 400MB to go. If in 10 years I finally fill her up, I’ll just pop in a microSD card. Done. Here’s where the PB360 really shines, and at the same time highlights why it may not be the best e-reader for everyone. I’ve come to love the interface on the PB360, but I’ll admit that when I first starting using it I snickered at its “made in China” feel. At first I thought it lacked a little of the sophistication I expect from consumer devices, but I’m a software tester by day and it’s my job to look out for crappy user experiences. But it’s been a year and my complaints are still minor, mostly that I read several books at once, and with only the two most recent on my home screen, I have to search through my collection more often. Using the Favorites list helps. And after trying the competition, I think it’s way more usable than the Kindle. There’s nothing really obtuse in the interface, it’s just not very flashy. Big deal. Manufacturer makes the decisions. The interface looks the way it looks, maybe you can change one or two things. You’re restricted to the service the manufacturer provides. Customer makes the decisions. You can customize practically everything. You can pick your own service. The Kindle is closer to number one. You have a couple fonts and a half-dozen font sizes to choose from. You have to void the warranty just to put on custom images for your screen-saver. You’re heavily tied into Amazon for buying books. You can get books elsewhere, but it usually means jumping through hoops, and forget DRMed purchases from other stores. The PB360 is closer to number two. You can customize almost everything. It comes with a few fonts, but you can add any regular True Type font you want and the PB360 can use it. Pick any font size. You can adjust the margins, the line spacing, every possible thing you could imagine about how the text looks, just like a word processor. I favor Gentium at 24pt, but you don’t have to, because the choice is yours. You can pick a different style for the menus. You can set whatever you want to be the screensaver image. You decide how much info you want in the status bar at the bottom of the screen, or even if you want one at all. You can even customize what every hardware button does, for both short and long presses. Saving bookmarks, adjusting the font size, skipping pages, every possible operation that you might want instant access to you can assign to a button. Important Note: Most of the best customizations require a custom version of fbreader (the software it uses to actually display the books), which is a must-install to maximize the PB360’s power. The PB360 gets reading books right, hands-down. I’ve already mentioned the fast page-turn and the ability to tweak the text to exactly what you want. With the fast page-turn mentioned above, a 10 second boot, and 5 seconds to open a book, I get in and reading right away. Even better, and this feature is killer, but during those 10 seconds it takes to boot, you can set the PB360 to automatically show a still image of the last page you were on. That means I can continue reading the instant after I hit the power button. And by the time I’ve hit the bottom of the page, the device is booted up for real, and I can turn to the next page without skipping a beat. I’m not putting the device to sleep, that’s on a cold boot. Which helps explain the monster battery life. I can afford to turn the device off completely every time, because of this feature alone. Add the easy to use main context menu and the custom button assignments, and I have complete control over my reading experience. Here’s where I think most people will have problems with the PB360, because there’s no obvious answer here, you have to decide yourself. With a Kindle or Nook you’re given a tightly integrated ecosystem where you’re never more than an on-device click away from getting new books. With an internet connection, you’ll be hard pressed to be left out in the cold with nothing to read. The PB360 doesn’t have a dedicated store, and I find that to be a big plus. The device can read a staggering number of formats (see the table above), including the almost-standard EPUB, of which there are many online stores to choose from. Kobo, Barnes and Noble, etc. The PB360 does support Adobe Digital Editions (ie. DRM), which means you can also get ebooks from your local library if they subscribe to Overdrive. You have only the USB port and the microSD to get books onto your PB360, which usually means you’ll need to be around a computer. The PB360 will show up like a regular mass storage device and you can copy files over without any special software. Since I live in a multi-platform world, this is perfect for me. I do use the cross-platform Calibre to manage my ebook collection, and it works wonderfully with the PB360. When I get books in other formats, Calibre makes short work of converting them. I keep the books organized by author on the device, which makes navigating my large collection pretty easy. In short, I love the freedom of choice the PB360 gives me, but I wouldn’t give one to my Grandmother unless I plan on always being on hand to add new books. If the idea of having to copy files over manually scares you, give Calibre a try, but it’s still not as easy as just going to the on-device store and clicking “Buy Now”. Yes, the PB360 supports PDF. No, I don’t use it often. It kind of works for fiction, and can reflow text reasonably well (with of course plenty of options to tweak it), but it’ll always look uglier than other ebook formats. If you’re looking at reading textbooks or anything with lots of diagrams or complicated layouts, you’re looking at the wrong device. The PB360 has a dictionary and can clip notes, set bookmarks, and the other things most e-readers can do these days. I’ve not needed any of it. Each book keeps it’s own place, and I’ve not needed to look up any words or felt the need to save anything for later. There’s also a tiny selection of other apps, games like Sudoku, and a way to have news feed like content (like an offline RSS reader), but that’s not why I bought the device. If anything it’s my only real complaint against the PB360, that I can’t hide that stuff on the home scene and add say, a larger list of recent books. But usually I’m too busy reading to care. I should note for completeness that the Kindle and Nook may offer other features like mp3 support (for a large awkward audiobook player maybe?) and text to speech, which the PB360 has no answer for. I loved the PocketBook 360 when I bought it a year ago, and I still love it now. I’ve read a bunch of books on it, and I expect to read many more over the years. The price is much better than it was a year ago (I paid close to $240 for mine) but I don’t regret it at all. I’ve since bought a Nook Color, but even after a single day I was back with my trusty PB360, and now the NC mostly collects dust.